Uriridiakoghene Onovakpuri returned to the Kapor Capital team in 2016. 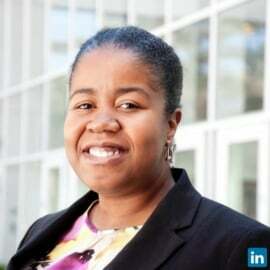 She is focused on sourcing investment opportunities, conducting diligence and supporting Kapor Capital’s portfolio companies particularly those in the digital health and medical technology industries. Previously, Uriridiakoghene served as Director of Global Programs at Village Capital, a global accelerator program and venture capital firm which supports healthcare, education, agriculture, energy and FinTech businesses. At Village Capital she worked side by side with entrepreneurs from around the world helping them grow their ideas into marketable businesses. Uriridiakoghene received her MBA with a concentration in Health Sector Management from Duke University’s Fuqua School of Business. She is a native San Franciscan and a proud UC Berkeley Alum. In her free time, you will likely find Uriridiakoghene watching Bollywood movies or playing with her niece Maya.